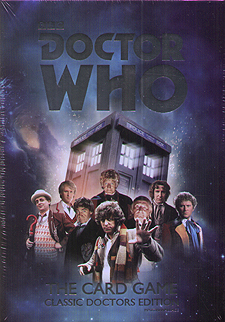 Defend the universe with classic incarnations of the Doctor and his companions. Use the Brigadier, the Sonic Screwdriver, Jelly Babies and other clever plans to save the day. Doctor Who: The Card Game Classic Doctors Edition is by internationally renowned designer Martin Wallace, and has been designed for both seasoned time-travelling gamers and newly regenerated players. Featuring favourite characters, enemies, and locations from the classic era of Doctor Who, the game contains everything you need to play: a set of English rules, 132 cards, a set of counters, and a player aid card.